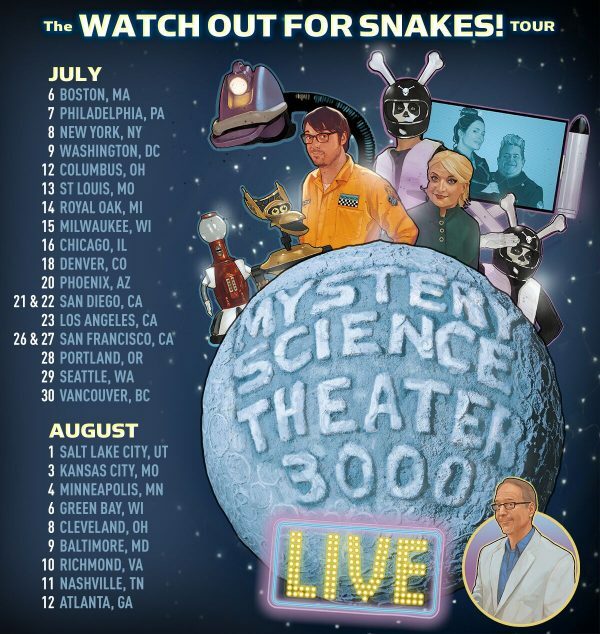 MST3K might soon be back in black online for your riffing pleasure! We need more animals in costumes! MORE! Wired has an article on Mystery Science Theater 3000, but the important part comes at the very end, when Joel Hodgson reveals plans for a new version of MST3K that will be online and feature a new host, but plenty of old school cameos. As this is just after Cinematic Titanic finished its touring for good at the end of 2013, it goes to show that things are always looking up. But this year Mystery Science Theater may finally get a long-­rumored, heavily anticipated reboot. 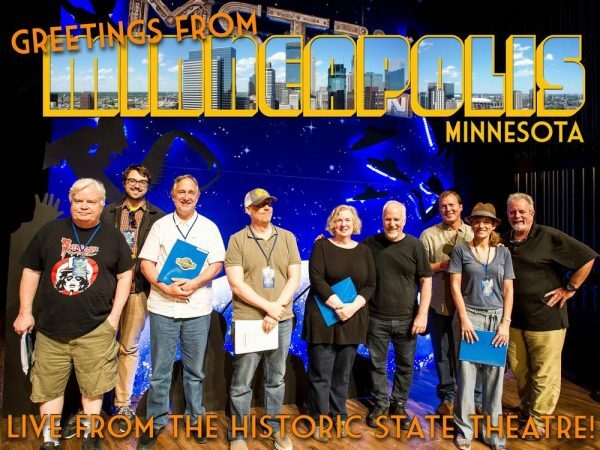 This spring Hodgson is hoping to start a new online incarnation of the show, one that will feature a fresh (and as-yet-unannounced) host and cameos from many MST3K alumni. Hodgson: I’ve talked to a bunch of fans about their lives and what MST3K means to them. I’m overwhelmed by how people took to that show. It really affected them. I thought, if enough people still love it, maybe we can bring it back. Even avid viewers sometimes don’t realize that every major role in the show had been swapped out over time. So in my mind, the show is built to be refreshed with new people and new ideas. 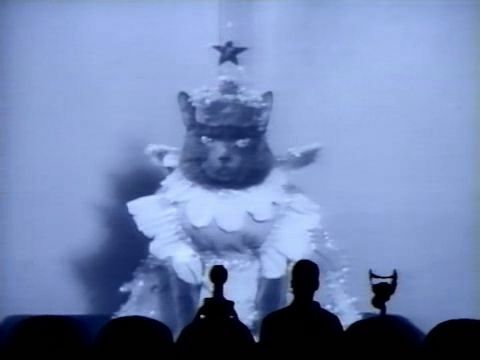 It’s like Heisenberg’s uncertainty principle as it applies to MST3K: If it doesn’t change, it’s not the same show. And fortunately for us, as long as there are movies, there are always going to be cheesy movies. All I can say is: I’ll be there! I regularly go see each RiffTrax and Cinematic Titanic live event, and a new version of MST3K will only be more gravy for my gravy train. Sure, there may be a new ignition of the Joel/Mike wars, but it will be like when Deep Space Nine uprooted the old Kirk/Picard battles and soon things became complicated. 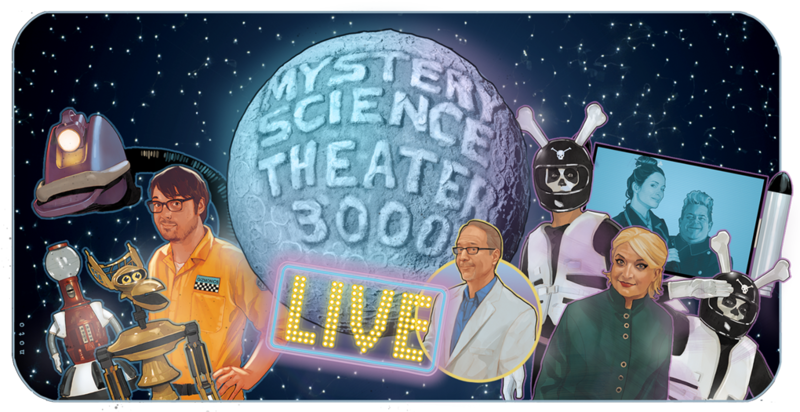 Joel Hodgson seems to be embracing his role as MST3K creator a lot more readily in recent years, even hosting an online-only Turkey Day Marathon in 2013. His Twitter feed has been active, including a few cool designs of rejected and unused bots. The main question is if Crow and Tom Servo will return, or will there be a new generation of robots to battle bad cinema along with the new host? Perhaps one day soon we will get the answers to these and other questions, until then, we can only dream. And watch the hundreds of episodes of MST3K, RiffTrax, and Cinematic Titanic. Like every good Mistie with cash to spare, I went to the Cinematic Titanic farewell tour, as the group gives their last hurrah due to their individual careers being busy enough to not allow the proper time for their show. The leg hit San Francisco in the historic Castro Theater, featuring a double header of The Doll Squad and The Astral Factor. Unfortunately, J. Elvis Weinstein was sick, so Cinematic Titanic featured host Dave “Gruber” Allen filled in for his spots. And also did a very spot on Josh impression for most of his lines. I attended the show along with Sheldrake from Pre-Code.com and Hellburger (his writing can be found on Can’t Stop the Movies) and his wife (the latter two were also at the Monster Squad screening earlier in the day.) We had a grand time hanging in the Castro between shows, as San Francisco was having an uncharacteristically nice day (which soon turned to a windy fest as we waited in line!) Despite a small ticket snafu that seemed to affect everyone who ordered online, soon we were seated with killer seats. Before the show there was the usual Castro organ playing, a signature event before every Castro screening. As we readied for The Doll Squad, the crew did their warmup acts. Gruber did a dance interpretation to a pop song. Frank did a monologue of jokes about where he was in life (he’s currently writing/performing for Totally Biased with W. Kamau Bell on FXX) Trace and Mary Jo performed an old Dutch play while Gruber did “riffs” badly – which was the humor. Then the show was to begin and Joel the introductions. If you have not seen The Doll Squad, know that it skews towards the better of Ted V. Mikels’ work. Which is to say that it is ridiculously awful. Someone is sabotaging rocket launches as blackmail against a Senator, so a gigantic 1970s computer spits out that “The Doll Squad” is the perfect group to find out what is going on. Some of the initial girls that their leader Sabrina (Francine York) recruits end up dead – graphically, as Mikels gained fame for gorey films. Eventually Sabrina recruits women faster than they can get killed off, and the team sets out to solve the mystery of who is blackmailing and why. This involves a lot of running around, sneaking around, and bumbling around. Things end up in a protracted gun battle for the finale that takes place in almost complete darkness. It’s not surprising at all to learn the entire sequence was filmed over one night. There is a lot of repetitive machine gun firing as scores of guards are mowed down. Sabrina manages to change her outfit in every scene, every single one is a crime against fashion, even for crazy 1970s fashion. Noted Star Trek villain Michael Ansara plays the heavy, a rogue CIA agent bent on unleashing a mutant strain of the bubonic plague upon the world because he’ll get rich or something. Favorite riffs include swipes at almost every ridiculous outfit Sabrina shows up in, as well as Joel yelling “SLEEP!” every time the disco-ball scene transition device is used – and it is used a lot. The Doll Squad is an amazing bit of cheese, but those not familiar with that type of film quality run the danger of becoming bored or sleepy. But with an energetic Cinematic Titanic crew firing off jokes, things turned into a laugh riot. The only real complaint I have is the sound levels weren’t balanced well in the beginning, making it hard to hear the riffers over the sound of the movie. That seemed to be corrected as the film continued. The second feature was the 1970s astral projection police mystery The Astral Factor, which is as exciting as that description indicates. If anything, The Astral Factor is a far inferior film to The Doll Squad, but those qualities also make it ripe for riffing, and it provided a huge target. I would rate The Astral Factor show as better, because the film is asking for it. Things got working again and away we went. The Astral Factor is pure 1970s boring pacing, complete with new age stuff like mind powers. A criminal has supernatural powers, allowing him to become invisible and has telekinesis. He escapes, and goes on a killing spree against the women that helped convict him after he killed his mother and other women. We follow Lt. Charles Barrett as he tries to solve the case, deal with his girlfriend Candy (who never seems to be wearing pants!) and his annoying partner Holt, who is constantly clicking a pen. Constantly. The entire movie. One scene, Barrett grabs his pen and replaces it with a pencil, and the crowd goes crazy. Elke Sommer is also present as a bitter drunken woman and one of the killer’s targets. Things plod along until the killer is electrocuted, which somehow causes him to be sucked away to another dimension. Which basically means no evidence to explain to anyone just what the crap was going on. Favorite riffs include the captain who looks like Blackenstein – causing monster growls whenever he appeared onscreen. There was an amazing piece as the hero slowly drove on the freeway to one of the women in danger, as well as a boat chase where the hero just falls off of the boat while trying to disembark. The Astral Factor is one of those films that looks like it belongs on television, probably filmed on tape to save money. Both films probably will never make it to dvd in Cinematic Titanic form, so unless someone gets a bright idea (like recording a commentary that can be downloaded from a website!) 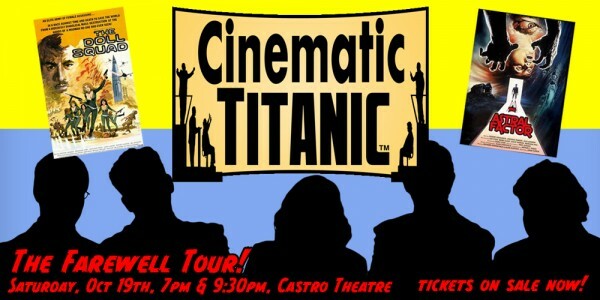 this might be the only time I’ll get to see these films riffed by Cinematic Titanic. So it was a special and bittersweet show. After the show there was a free signing by the cast, but as it was around 1 am and everyone was tired, it wasn’t the most energetic atmosphere. Still, everyone was friendly and sincerely grateful at the support shown. I got more signatures for my Amazing Colossal Episode Guide, and got to shake everyone’s hand. So all in all, a great night. So a final salute to Cinematic Titanic, long may she live on DVD and streaming video. And occasional reunion shows, please???? Holy Torgo! It’s real! It’s called Project Popcorn.